Packsize is a revolutionary company. They offer machines that create on demand packaging at the perfect size. No more wasted space in a box or over sized shipping costs. 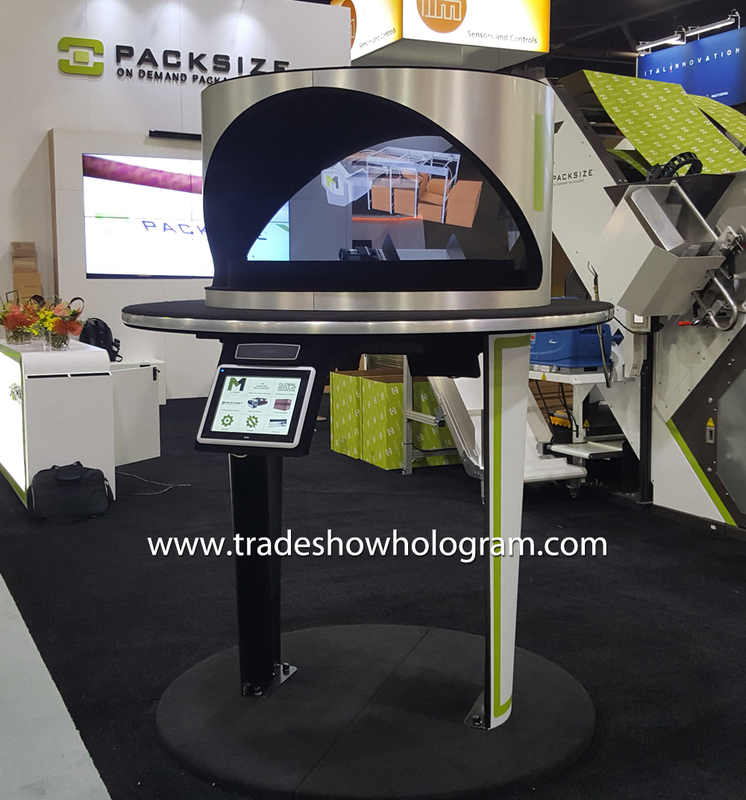 Packsize exhibited at MODEX 2018 at the World Congress Centre in Atlanta. They asked Trade Show Holograms to assist them. 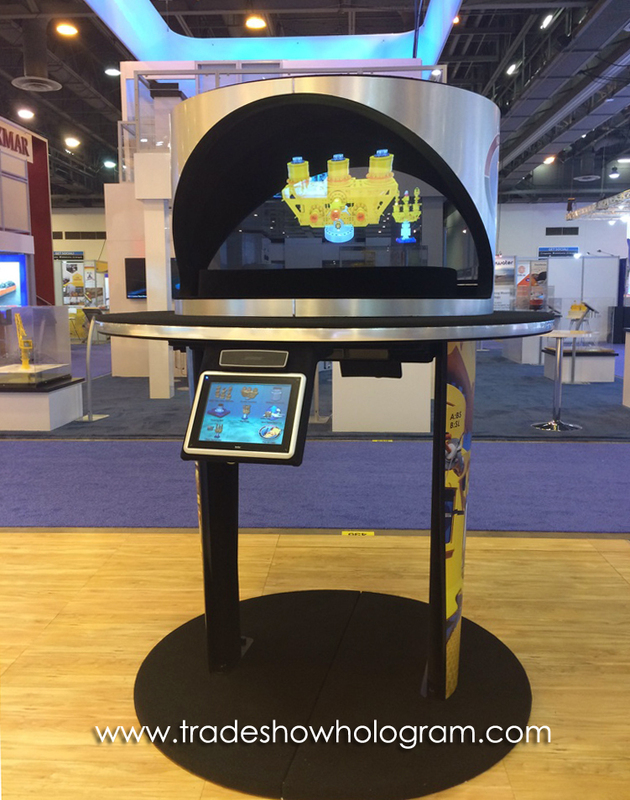 The goal was to create a 3D interactive presentation for visitors to their booth. 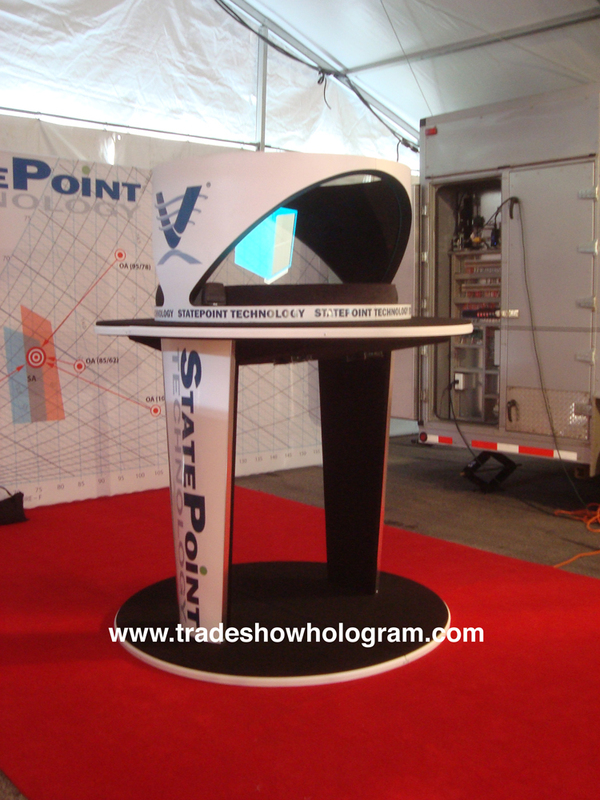 The 3D hologram projector pictured here is one of the designs offered by the Trade Show Holograms. 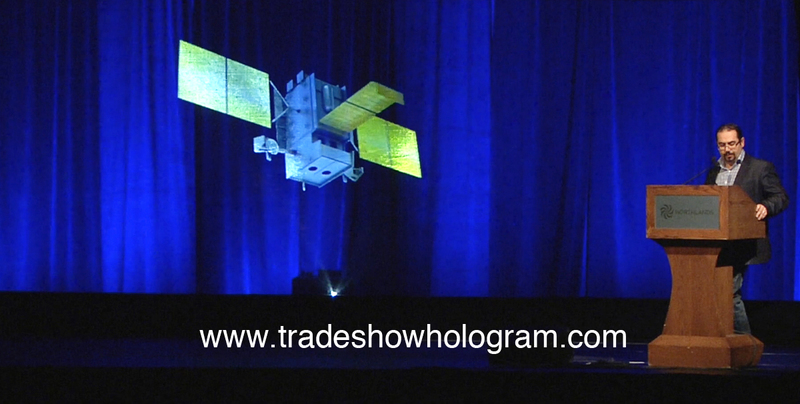 Trade Show Holograms is a company that offers the unique crowd attracting displays for rent and purchase around the globe. This kiosk features the new “Ultra bright” projection feature. It projects images in full 1080 HD quality. It also features an accompanying audio narrative during the hologram presentation. Viewers can call up multiple presentation chapters on demand via a touch screen on either side of the display. 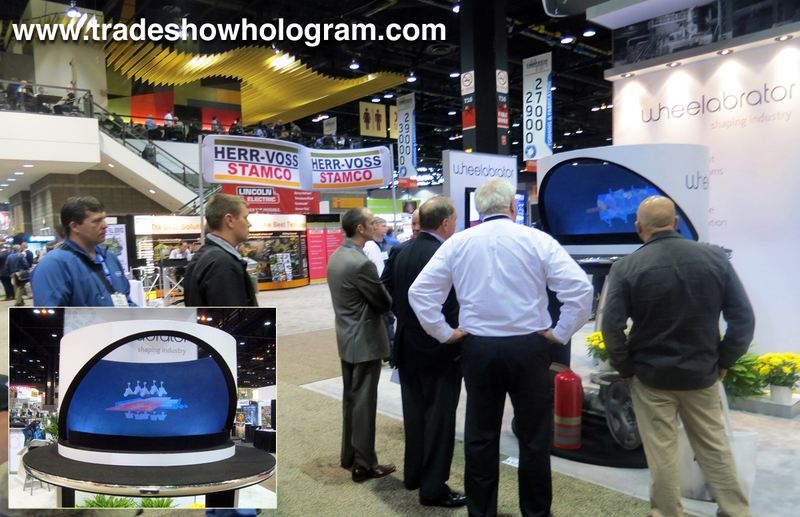 This dual projector system offers booth visitors to watch separate holographic presentations on either side. One presentation will not interfering with the other. This doubles the amount of interactivity in the same floor footprint. 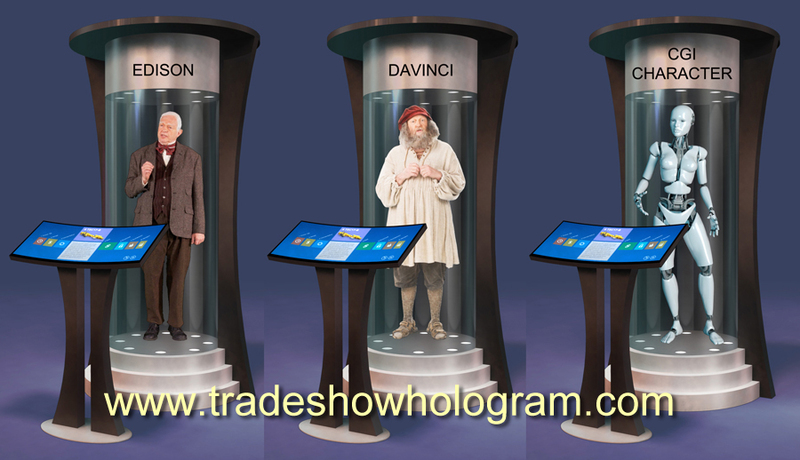 For more information you can visit the Trade Show Holograms website. 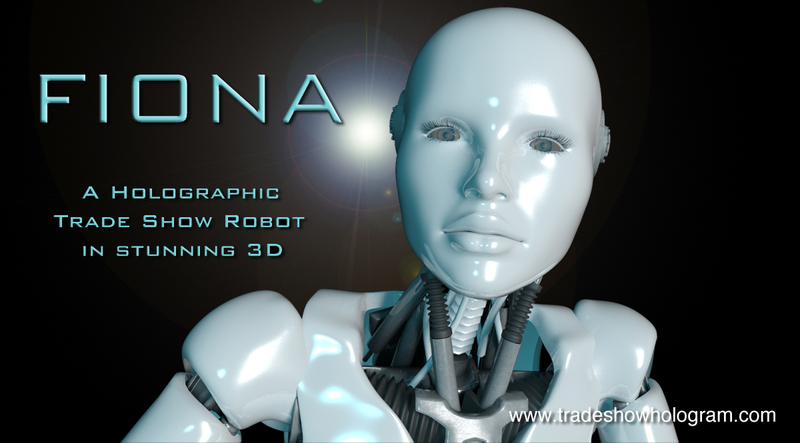 The 3D hologram projector displays full color as well as realistic textures. Interactive 3D hologram projector displays PACKSIZE M1 machine. 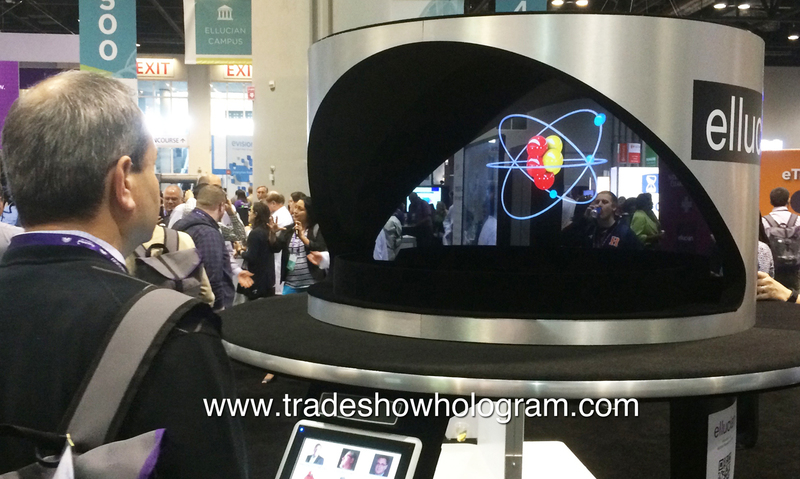 Life Sized Holographic Presenter attracts attention at trade show. Congratulation to 4Dx Inc. for winning 1st runner up in the Best Booth category for ATS 2018 in San Diego California. 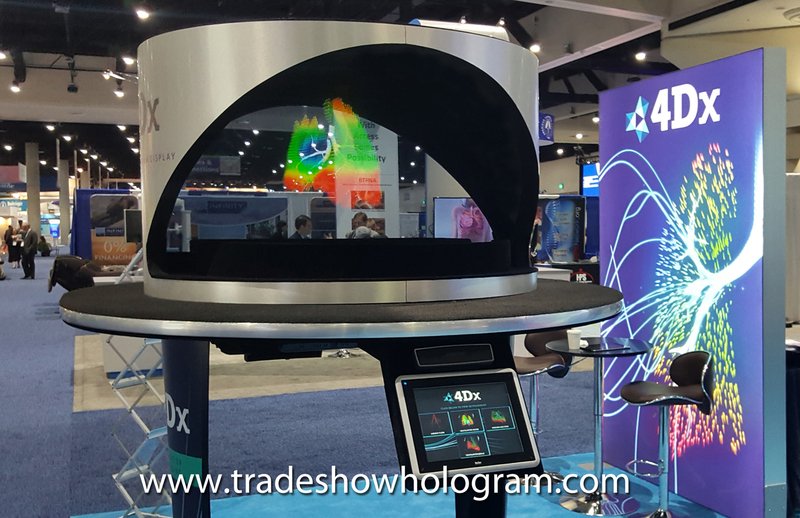 The 4Dx booth featured a 3D hologram projector to display lung scanning images in 3D for visitors to their booth. The dual sided, interactive holographic projector was developed by Trade Show Holograms and projects full HD 1080p content. 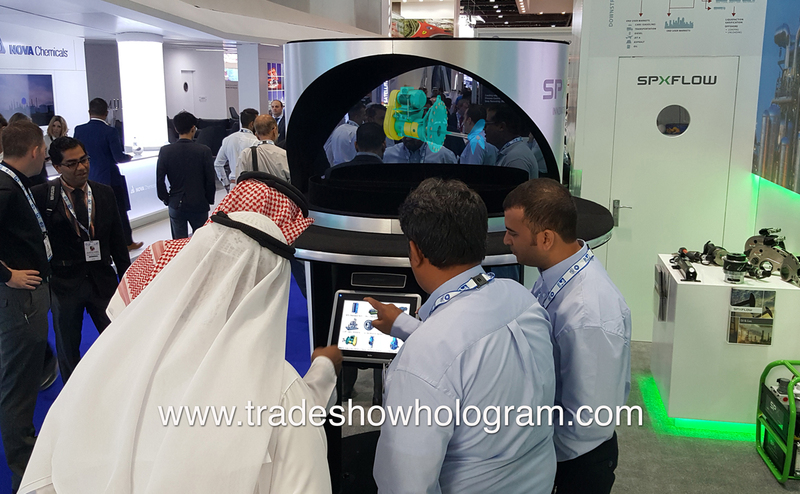 Trade Show visitors interact with 3D Hologram Projector at trade show booth. Vistors to CDA Presents 2016 in San Francisco were treated to 3D holographic presentations of the new Philips Sonicare App. Guests could access any of the available holographic demonstrations via an interactive touch screen on either side of the hologram projector. 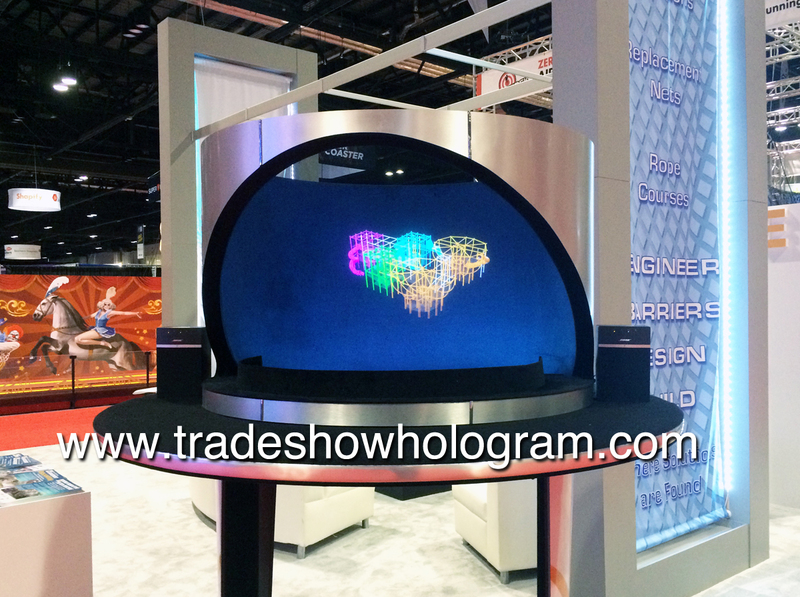 The new interactive trade show exhibit was provided by Trade Show Holograms. The dual sided design allowed for visitors to watch two different presentations on opposing sides of the display with out interfering with each other. No 3D glasses are required to see the amazing 3D effect. 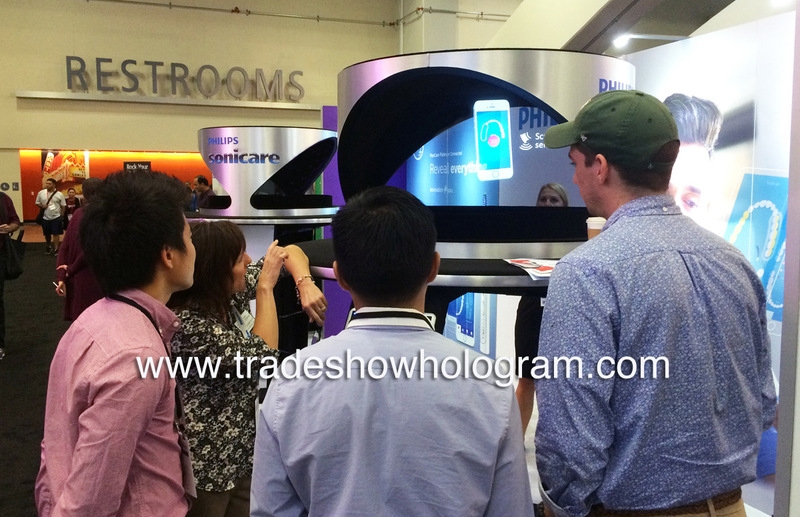 Interactive Hologram Projector is featured at Trade Show in San Francisco. 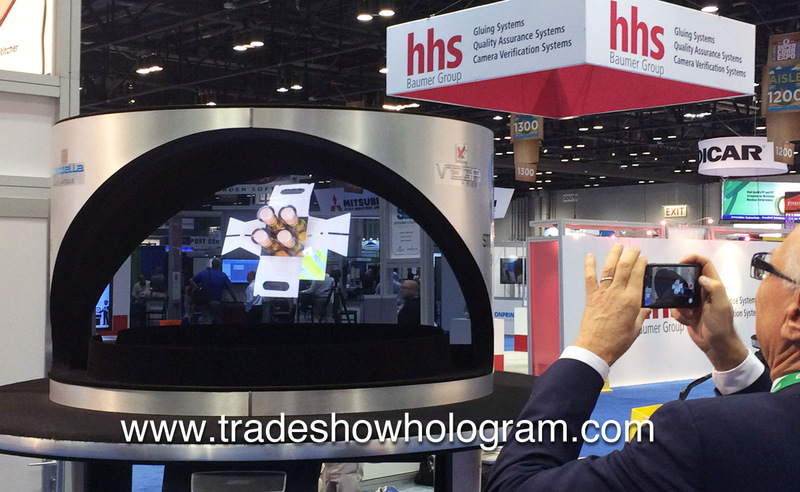 Trade Show Holograms exhibited one of their dual interactive hologram projectors at booth # 1067 at SuperCorrExpo in Orlando Florida. 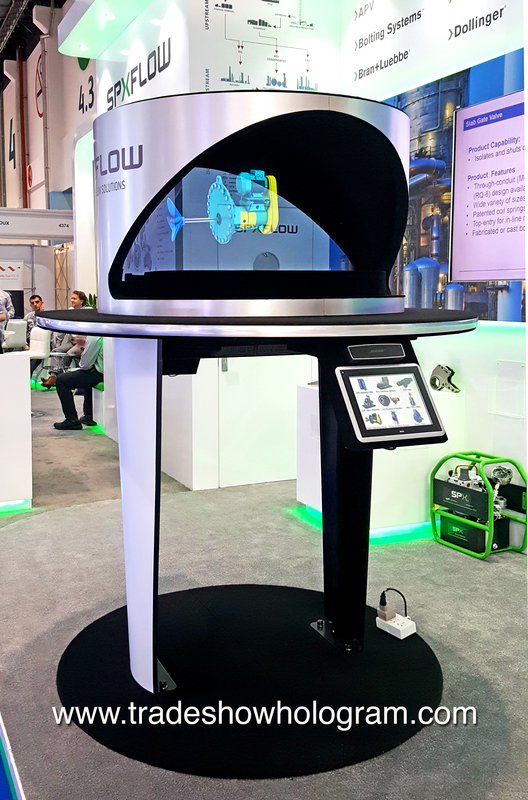 The display features the new ultra bright technology as well as the interactive touch screen that allows booth visitors to call up holograms of interest on demand by simply touching an icon on the screen. Viewers can watch multiple 3d presentations floating in mid air. 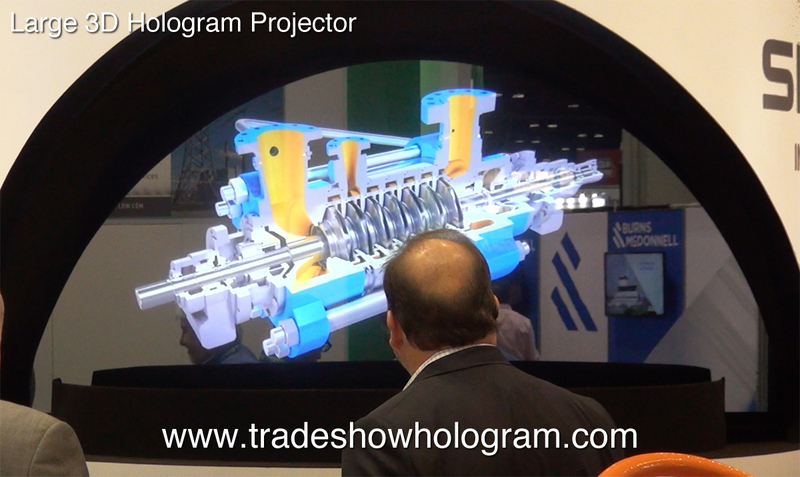 The new ultra bright display system allows for bright holographic projections even in bright trade show environments. 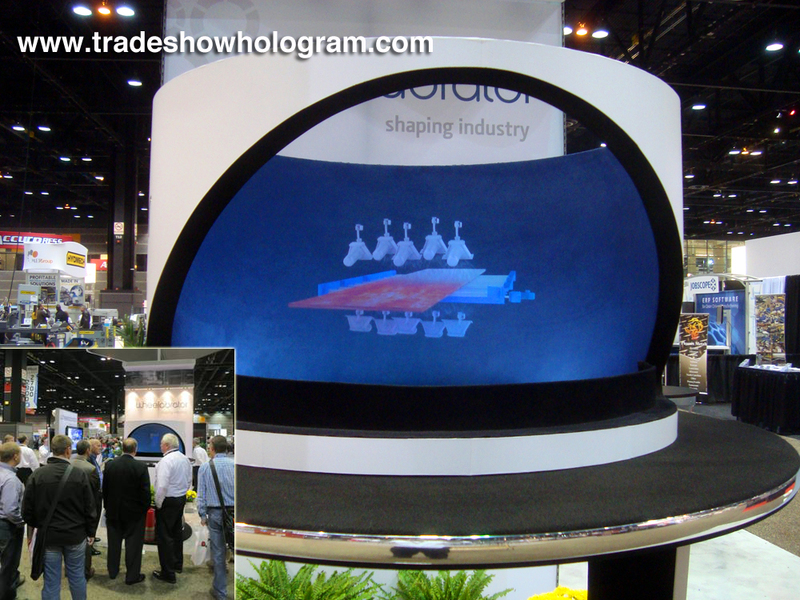 Hologram Projector attracts attention to SuperCorrExpo trade show booth. 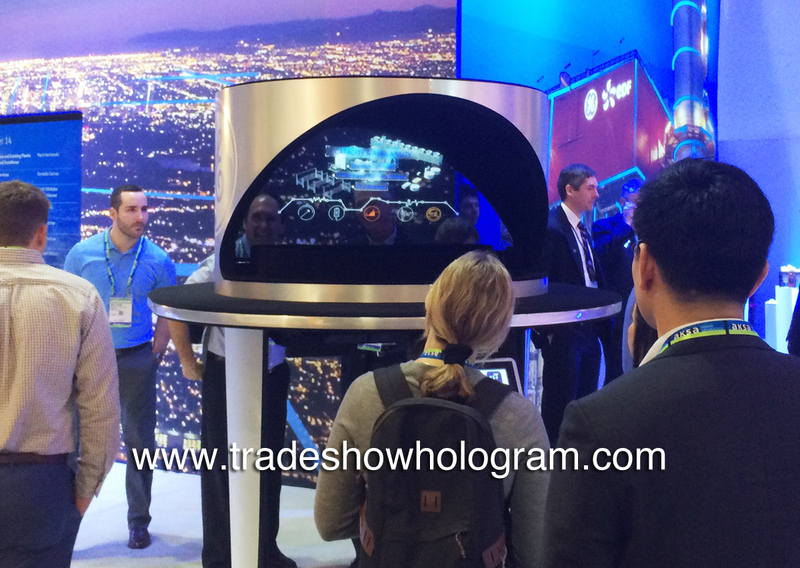 Large Interactive 3D Hologram Display exhibited at trade show. Visitors to the Castexpo 2016 saw the debut of a new Dual Sided Ultra Bright 3D Hologram Projector. 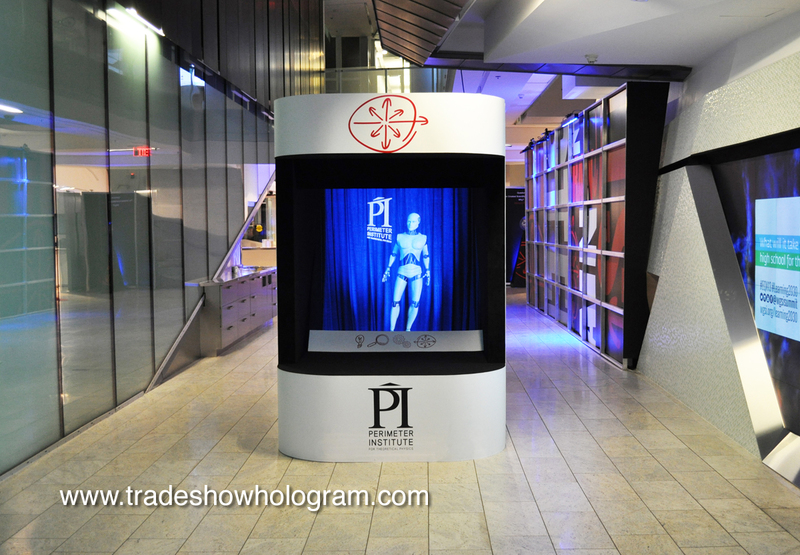 The new display from Trade Show Holograms projects images up to 31 inches tall and 57 inches wide. In addition to the upgraded projection technology which allows for brighter images is the new touch pad ” on demand ” play feature. Viewers can choose between 9 separate holograms at any given time by simply touching an icon on the touch pad. The projector can also display a totally separate image on either side of the display without interfering with the opposite side. 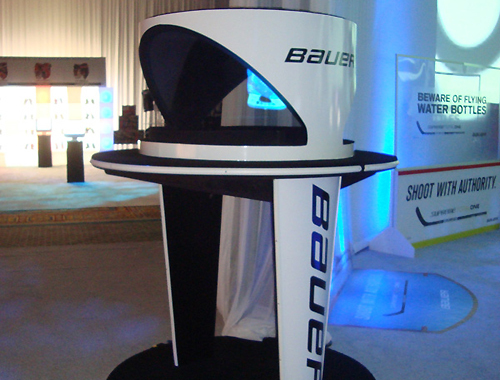 This new design is now available for rental or sale across North America for trade show and special events. When your keynote speech is about future technology it helps to make that point with a futuristic presentation media. Wade Barnes of Farmers Edge presented a keynote speech on BIG DATA and the future of the agriculture business. He enlisted the help of a large scale 3D hologram projector to present his message in both an informative and entertaining way. The audience was treated to stunning 3D visuals up to 8 ft high and 15 ft wide which appeared to float in mid air, enhanced by sound effects. 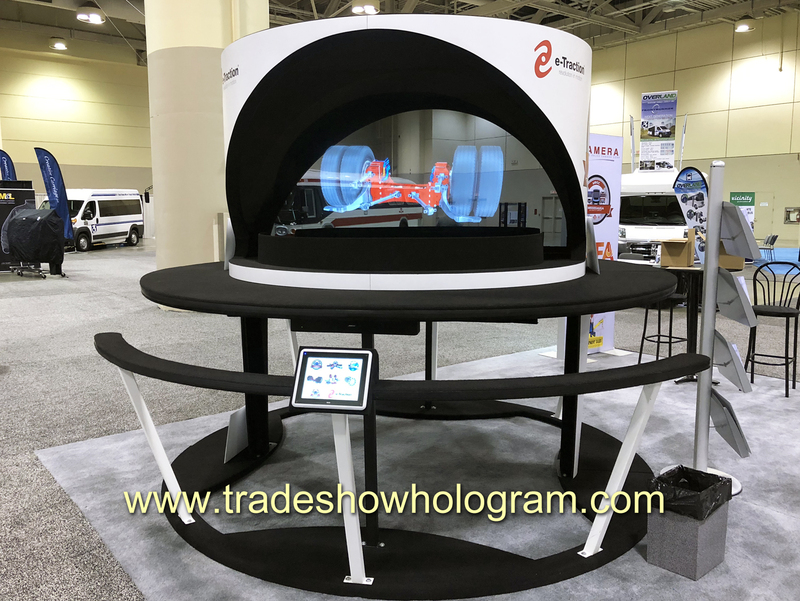 The projection systems are a product of Trade Show Holograms, a company that has specialized in 3D projection across North America for 8 years. With the appearance of holograms in hollywood films such as Star Wars and the Iron Man series audiences are thrill to see the effect happen in 3D before their own eyes and not on a movie screen. This presentation was part of a keynote at the 2015 Farm Tech held in Edmonton Alberta Canada. A large 3D holographic satellite appears to float in mid air. New Large 3D Hologram Projector featured at Nashville Music City Convention Center. 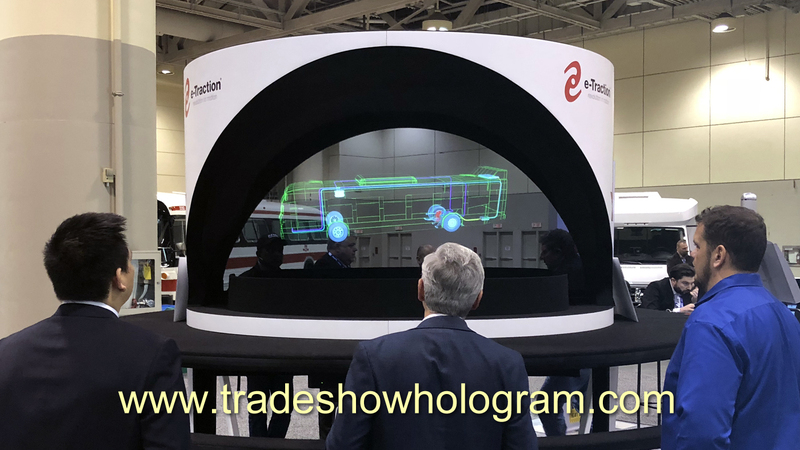 Trade Show Holograms unveiled another new design in its line of 3D Hologram Projector Exhibits for trade shows and conferences. The new display attracted much attention to the Burckhardt Compression booth at the 2014 GMRC Gas Machinery Conference held in Nashville TN. Highlights of various large scale compressors were shown in a 3D format floating in mid air. 2D monitors placed in the front of the display featured more detailed information. This years APPEX show was held at the Sands Expo and Convention Center in Las Vegas. Among the more specialized exhibits was a 3D hologram projector exhibited at the Melling/Durabond booth. The holographic presentation was a popular attraction and drew crowds who watched objects floating in mid air telling the story of the history of the Melling companies around the world. 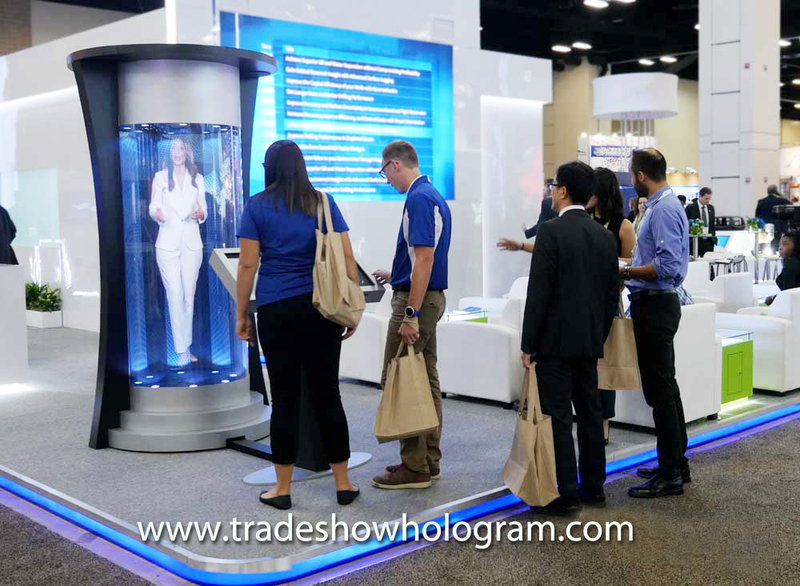 The hologram exhibit and content was provided by Trade Show Holograms, a company that has been creating holographic presentations both large and small for corporate events and trade shows since 2006. Exhibits are available for sale or as a rental. 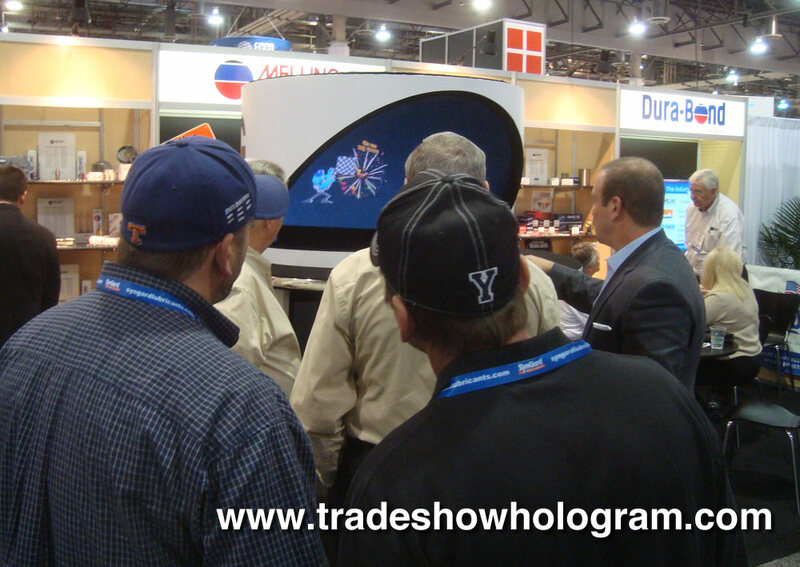 3D Hologram Exhibit a bit hit at Las Vegas APPEX trade show. The APPEX 2013 show was held at the Sands Expo in Las Vegas Nevada and Trade Show Holograms exhibited a 3D hologram projector at the show. Visitors to the show were treated to a 3D presentation ( without the use of any 3D glasses ) on the company history of Melling and Durabond. 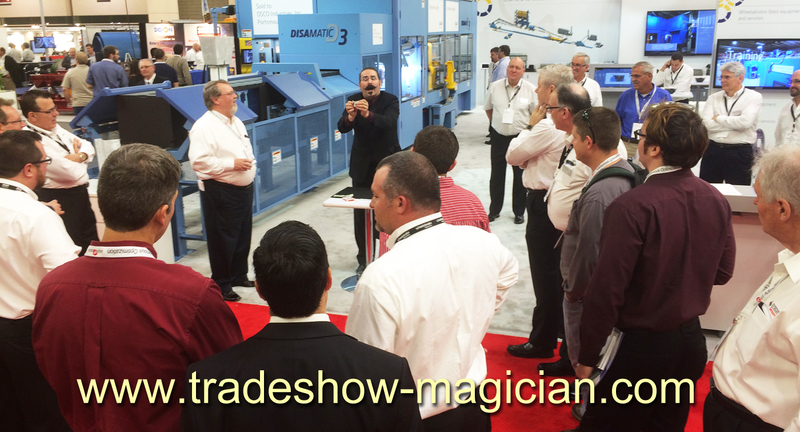 The exhibit proved to be very popular with trade show attendees. 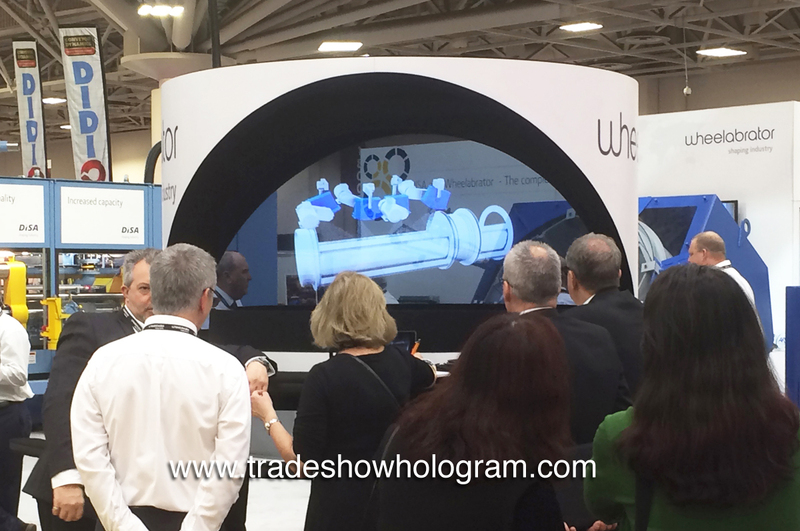 3D Hologram Projectors are a easy way to draw visitors into a trade show booth. Illusionist Timothy Drake has created a trade show exhibit that takes up little floor space and gives a lot of WOW factor for the floor space used. The hologram projectors are either rented by clients or purchased for more permanent use as lobby displays at corporate offices. The Hologram projectors project a clients presentation into mid air in 3D.